Sometimes I forget what an age of science fiction that we live in. 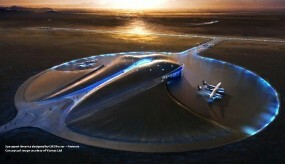 Virgin Galactic has just recently broke ground on Spaceport America, the very first commercial space sport. Spaceport America is going to be built in New Mexico, and this 110,000 square foot facility is designed by Foster and Partners. The runway is 10,000 feet long and 200 feet wide. It will cost about $200 million to complete, and should be done by 2011. So it should be two years before the average person will be able to fly into space as a tourist. By “average person”, I mean anyone who has $200,000 to spare. Yeah, I didn’t think this whole tourist space travel thing would be cheap, either. You might notice that in this artist concept drawing, you can see some ships that look a lot like Spaceship 2. The whole airport was designed by a team that has created some innovative Beijing and Hong Kong airports. Not only is it unique in its look, but it is environmental. It has solar energy for power and a wastewater recycling plant. I am excited about this spaceport! Even if I can never afford a flight, I heard that there is a 4,000 square feet public viewing gallery. If nothing else, Spaceport America could be quite a tourist trap on Earth, if not in space. Welcome to Vagport America. I guess they went with the little blue man in the boat, instead of pink, so as to be not blatent. Can you just build a spaceport(runway)? Do you need FAA or NASA permission?